We define digital capability as the extent to which the culture, policies and infrastructure of an organisation enable and support digital practices. Our work and understanding of digital literacies for individuals has evolved over the years to now expressing these as digital capabilities. 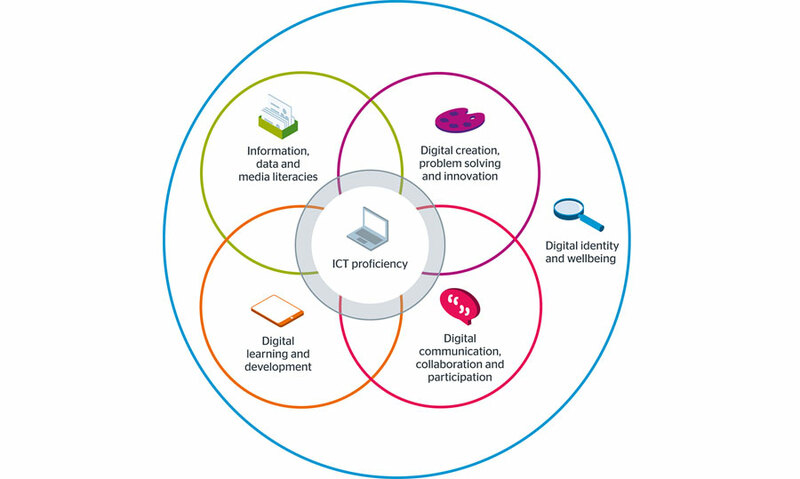 At an individual level, we define digital literacies as the capabilities which fit someone for living, learning and working in a digital society. At organisational level, we need to look beyond the capabilities of individuals and be concerned with the extent to which the identity, culture and infrastructure of an institution enables and motivates digital practices. Technological change is not a new phenomenon. In the 21st century we are experiencing an unprecedented and sustained rate of growth in terms of digital innovation and creativity. While ‘the value of digital capability in economic terms for the UK’ is acknowledged as ‘enormous’ (make or break: the UK’s digital future (pdf), House of Lords select committee on digital skills, 2015) the rate at which educational institutions can adopt these technologies and adapt their practices is an acknowledged challenge. This is made more complex by the large and diverse communities they support and employ, the variety of professional and vocational specialisms they serve, legal and administrative responsibilities, financial considerations and many other factors. Technology is changing both working processes and the nature of work and knowledge practices. In our report deepening digital know-how: building digital talent (pdf) (August 2015), author Helen Beetham looks at how the digital capabilities of teaching and professional staff are framed in UK HE and FE institutions and the organisational landscape as this influences future requirements. In their October 2016 Horizon Project Strategic Brief on Digital Literacy, the New Media Consortium (NMC) acknowledge the variety of digital practices that current students need to master and look ahead to future digital literacy needs in fields such as data processing and analysis, coding, robotics and artificial intelligence. While generic, cross-disciplinary digital skills are necessary, it is often the specialised digital skills of their subject area that open up career pathways for students. Looking beyond specialist and subject specific digital skills, the concept of digital entrepreneurialism encompasses the need for those entering the employment market to drive digital forward. Our research into developing student employability found that expectations from employers and education providers in relation to digital entrepreneurialism is low. To ensure students are developing these skills, their learning experiences need to be embracing these practices. Our building digital capability project has been exploring how the development of digital literacies is supported at an institutional level. It has involved in collaboration with HE and FE institutions, government departments, sector bodies, professional associations and other stakeholders. It led to the development of our digital capability framework (pdf) which describes six overlapping elements of digital capability for staff and students. On our digital capability project blog, Sarah Davies, head of higher education and student experience, outlined what we already knew about this area (September 2014) and provides a concise summary of previous work including our developing digital literacies programme (2011-13). Our understanding of the digital capabilities that students and staff need has been informed by other related initiatives such as effective learning analytics, our research on developing student employability, and scaling up online learning, our digital student project and change agents’ network.